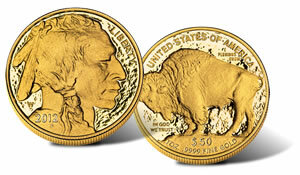 The United States Mint began selling the 2012-W $50 American Buffalo Gold Proof Coin on Thursday, March 15. By Monday, March 19, its sales debut hit $8,055,600 as collectors ordered 4,110 coins. Fewer of this year’s Buffalos were purchased during its opening sales days than in past years, but that could be the result of collectors staying on the sidelines. Debut sales were bottled to some degree as the 99.99% fine gold coin launched at the highest price in series history –$1,960.00, and coincidently soon after gold prices had tumbled from $1,700 an ounce to below $1,650. Since the U.S. Mint adjusts the one ounce Buffalo gold coin’s price predominantly on a weekly average of gold and up to once a week each Wednesday, some collectors will stay in a purchase holding pattern in an attempt to claim one at a cheaper price. It does not appear as if that opportunity will present itself this Wednesday. As the following table reveals, American Buffalo Gold Proof Coins enjoyed stronger debuts when fewer dollars were needed to buy one. *The U.S. Mint continues to offer 2011-dated Buffalos along side this year’s issue. However, the bureau did not report updated sales figures this week for the older coin. As such, the sales above are as of March 12, 2012. Orders for the 2011-2012 Buffalo Gold Proof Coins may be placed at the Mint’s toll-free number 1-800- USA-MINT (872-6468). Online ordering is available at http://www.usmint.gov/, or directly here. There are no order or household limits in place. The U.S. Mint also strikes investment-grade bullion versions of the Buffalo coin. Like the collector proof, it features the same designs and 24 karat purity, but lacks the proof finish and West Point "W" mint mark. Additionally, the Mint does not offer bullion coins directly to the public like the proofs. Instead, they are distributed through a network of "Authorized Purchasers" who in turn resell the coins for a small premium over the current price of gold. The 2011-dated bullion Buffalo coin was released on March 5, 2012.